I know there is a trend of parents abandoning the big birthday parties for their kids. I think several factors are behind this trend: people want to spend their money on experiences, long invite lists (classmates, your friends’ kids and family), and then there is social media. Instagram and Pinterest have put pressures on parents to have picture perfect parties. Without further ado - in January my mom was ready to start crafting for Lennon’s 3rd birthday - in July. So looking around our living room, I thought - what theme could I pick now that she won’t hate in six months. And I spotted her favorite Christmas present - the Barbie Camper. 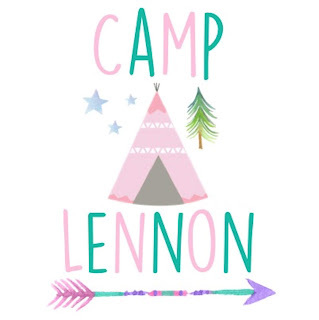 And that is how “Camp Lennon” was born. While my kid loves every Disney princess, she changes her preference really quick. If I plan her birthday around a character six-month out, she may not love that theme when the party approaches. With the help of Etsy, I purchased some illustrated camp-themed clip art and created a logo. This set the tone for the other crafts. Last year, we discovered the perfect little park with a picnic shelter adjacent to a large playground - a great setting for Camp Lennon. Here are some of the party details. You’ll see that I did my best to carry the logo through various elements. I used Zazzle to make the birthday girl a shirt with the Camp Lennon logo. One of the first things that I crafted were these camp pennant signs to use as centerpieces on the tables. The backside had a teepee. I needed something to hold down the flags, so I put them into these pastel tinted jars from a craft store with rocks. My mom made favor "knapsacks" using bandanas and sticks! Don't feed the bears scavenger hunt! Happy Trail-Mix Bar. A little hard to see, but we had Grizzly Bears (gummy bears), Teddy Bears (teddy grahams), the Catch of the Day (goldfish), Rainbow Trout (multi-color goldfish) and Fish Bait (gummy worms). Arts & Crafts table. This was a last minute addition when the weather forecast wasn't in our favor. Campers could make their own necklace, camp pennant, or canvas bag. For the bags, I had various felt stickers and fabric markers. The birthday girl picked out her cake from some photos online. "Pink with sprinkles" was her inspiration. I was really proud of the container that I found for my "dirt." You almost can't spot it in the bark bowl!